You need more than a bow tie and a pocket protector to become hailed as a king amongst nerds everywhere. You'll have to become the king nerd, heart, and soul. Work on the goofy laugh, the hunched over posture, and you'd better know your science facts backward and forwards. Hey, you might even want to dust a little chalk on your pants, it can't hurt. 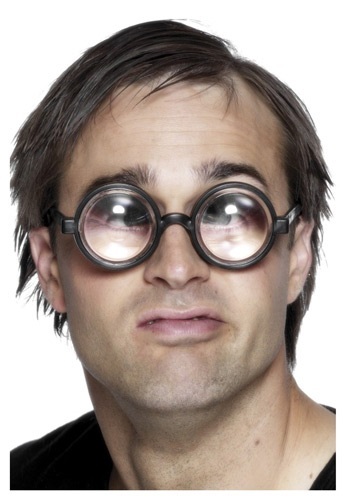 If you really would like to become king of the nerds, you need the dorkiest glasses available. You need thick lenses that look bullet-proof, no one can know what you are thinking. You don't want them stealing your brilliant ideas. These bug eye specs are just what the nerd doctor ordered. He might have also ordered a set of suspenders too, it certainly wouldn't hurt. It won't be long before you impress the lesser smarties of the nerd convention. So, whether you're a trailer park all-star or king of nerds, these glasses shall serve ye well.